Her bright lights lit our travels and our smiles. We’ll ne’er forget her smooth ride and black wheels. May your slumber be peaceful and your oil clean. 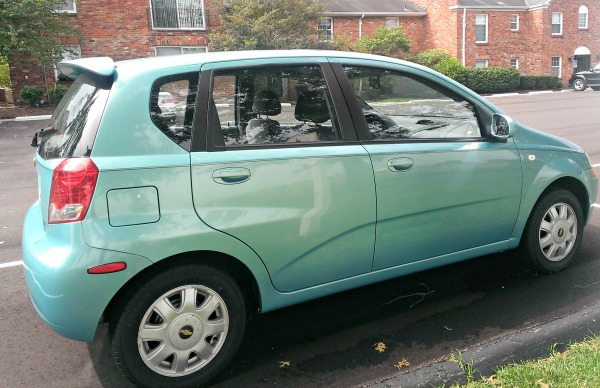 Goodbye, sweet aveo, our beautiful, wonderful machine! 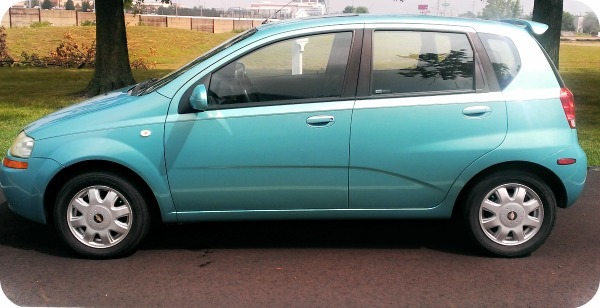 Just before the stop sign that permanently checked our car into extinction, we had just been loving our aqua Aveo. The bright little car had drawn appreciative looks and smiles as it scooted down to the shops and to work. The car had never given us grief, even though others seemed determined to crash into us at every opportunity. What was it about our bright, shiny color that attracted other cars to it like flies? We remember the horror of the slowly reversing SUV in the grocery parking lot that dented our door, or cringe with phantom pain as the man smashed his door open into ours at a burger joint (they kindly paid for our meal, but it didn’t erase the small dent). There were the scary icy spiels and the distracted teenagers ignoring stop signs. Through it all, the trooper kept chugging. Still, it got us where we needed with nary a squeak and we loved our car. It was only the second car we had bought and it had a lot of memories. We went on summer trips to renaissance fairs, attractions and to see family. We traveled to nearby cities and carted our pets, flowers and groceries. People would stop us and say “That sure is a nice car! I love that color!” as we got out. Until its timing belt pulley decided to break and suddenly there were no more sunny vacations in its future. Now, it’s probably destined for the scrap yard. This happened in April and it wasn’t until a week ago that we finally got up the nerve to sell it. It sat for four months as we struggled with what to do. Do we keep it and fix it for a cool $5k? Do we trade it in for another car and risk two car loans? Do we sell it and deal with the hassle of a sale? While the offer arrived quickly (got it the night we submitted our info), the actual process of getting rid of the car was laborious. Fill out their form with all of your details and the car’s nitty-gritty. Wait to receive offer, once received, accept or decline it. They called us the next day and the day after asking us our decision. It was like we couldn’t get them to stop calling us. This did give the impression they were on top of things (especially since the offer expires after 10 days). Accept their offer by calling their number. Then, if you happen to live in a large city but unfortunate enough not to live anywhere near their dealers, you wait. And wait. We waited for the guy to ask his boss (who was in a meeting) about what to do. We called back the next day when no call came and then waited to hear from the dealer that was finally assigned to us (they had no clue what we were talking about and called AutoNation Direct who said they had given it to the wrong people). Then we waited for the call from the correct dealer that we were promised would happen within 24hrs. No call until 48 hours later to confirm that, yes, we did want to still sell it. Then we waited again for the call on the day they were to pick up the car and drop off our check. Finally, you hand over your title, take your check and say a sad goodbye to your wonderful, beautiful car. And after all that delay, they had the gall to knock off $4! We were so tired of it by that point that we didn’t argue. Just took the loss and moved on. In all, while AutoNation Direct does take your car and they do give you a check, the actual process was tedious. Would we do it again? Not sure. I suppose we might, but I think next time we’ll remember how it all went and we might go a different route. We wish we had traded it in when we bought the new one, but that’s all over now. I don’t know if the process is smoother if you happen to live next door to them. I don’t know if you get more money if your car lacks major repairs. Maybe our experience was hampered by living in a big city that they didn’t actively support. I’d give the process a 3/5. It got the job done, so no complaints there, but if you have other routes, maybe look into them first before you go with AutoNation Direct. They aren’t bad, but they weren’t something to gush over, either. Categories: Musings, Review | Tags: Review | Permalink. Being already Christmas Eve, I always wonder who exactly believes, I mean really believes that this is the “most wonderful time of the year”. 😐 Between all of the cookie baking, blitz cleaning and gift wrapping I remember why I don’t really like Christmas. Of course, once the BIG day arrives it’s like giving birth to your first born. There’s excitement and happiness as you eat all of that yummy food you spent the last week prepping, and all of the pain and suffering of the previous 30 days are magically wiped clean away. Ah, Christmas! Thanksgiving doesn’t even compare. Once the new year arrives all fresh and sparkling with promise, hopefully we can all kick back and relax a bit. I know I plan to indulge in a bit of me time. Like go through my old school work boxes and finally toss the lot in the recycling bin (so I like to organize a bit for fun!). Or play some computer games that I’ve been woefully ignoring (Playstation, here’s looking at you). I may even just sit back on the couch with a blanket tucked around my feet and a good book in hand. Quiet coziness with a touch of adventure sounds heavenly right about now! Admittedly I’m lucky that I work in a place that lets me listen to audiobooks so I get through books like they were cookies. If I had to rely on actually sitting down with a real paper and glue book, well, let’s just say that the ghost of English degrees past would come and haunt me. So, with little ado, here are my top reads for 2013! A brief summary and opinion is presented for you so as to avoid spoilers but whet the appetite. You can always follow my reads on Goodreads (see the widget in my right sidebar). Best in Series: The Dresden Files by Jim Butcher. Meet Harry Dresden – a wizard trying to make a living in modern-day Chicago with a batch of quirky friends and a whole lot of evil enemies. Mainstream Chicago doesn’t know about the magical underbelly of the city and it’s only the gruesome side that they see. This is paranormal without the glitz. There’s real pain and real nastiness in this series that doesn’t waffle in the romantic side like a lot of other paranormal books. I like how wise-cracking Dresden can be and it’s that lightness mixed with grit that keeps me reading this series. It’s also one of those rare series that keeps getting better and not weaker (like some other series *Evanovich*) and Butcher actually develops the lives of his characters (*Evanovich*). The sheer number of books is a bit daunting, but I don’t let it get to me. I savor each book and I let a bit of time pass before I indulge again. These are books with weight, and I find a bit of time in-between can make each read that much better. This novel plays with time and distance that can make your head hurt a bit if you think too hard. If you just accept it and focus more on the teenage girl trying to live in modern day Japan after living in the US, the 30-something writer who is trying to exist in the way-beyond on the West coast, and the diary that connects the two and their existences, then you’re good to go. It’s a complicated and sometimes brutal novel that I found difficult to put down. I connected with both characters and their dual ethnicities and with a lot of the day-to-day identity issues they face. It’s a wonderfully told tale that carries you along like the wave that carries the girl’s diary to the woman across the world and the pasts that bind them together. I laughed out loud more with this novel than with any other this year (and that included Sedaris’ very funny Let’s Explore Diabetes with Owls) It’s crazy and snappy and just spot on in its ridiculousness to draw light to the reality of the characters’ situations. Bernadette is a mother whose architectural career has been put on hold after the birth of her daughter, Bee. Her marriage, her relationship with her daughter and the people of Seattle are all tested when her daughter announces that she wants to go to the Antarctic if she gets all As. It’s told from Bee’s perspective for the majority of the book but it becomes more of a “portfolio” once Bernadette goes missing and Bee sets out to discover everything that might have led to her mother’s disappearance. I loved the freshness of this book and how it tells a typical story of a woman who’s lost her way in a completely different and hilarious way. Skulduggery isn’t your normal PI –he’s a skeleton for one and a wizard to boot. And he’s just acquired a new partner in sleuthing, twelve year old Stephanie Edgley. Except something wants Stephanie dead and it’s up to the two of them to stop the evil from manifesting. This is a paranormal world that feels more Dresden for kids and the interplay between the two characters had me smiling. I liked how quick and witty it was and how it was a kid’s book that felt intelligent and fun. Skulduggery’s life is still mysterious by the end, but what we do learn left me wanting the next book in the series. This is the sort of novel I’d have devoured as a child and I loved it more for giving me the chance to feel 12 again. Not really a how-to guide at all but more of a “this is what I learned” kind of book. Moran is part crude, part intense but all woman as she lays out what it means to her to be a woman. I agree on most of her points (and not quite agree on others) and while I can’t say we share any life stories, the essence of the experiences are definitely relatable. I found her bluntness refreshing in a way because it burst the topic out of its confines. True, sometimes she seems to do it for the sake of shock and awe, but the very fact that it didn’t bother me after a bit means that our own hang-ups are just that – they aren’t intrinsic to the words themselves but to the ideas wrapped up in the surrounding mess. I only wish I had this book to read as a young feminist growing up in an anti-feminist culture. There were so many good cookbooks this year that it was hard to narrow it down. I picked this one, though, because it has a bit of everything and it’s all veg. I’m not a vegan since I eat a bit of dairy, but I appreciated the vegan recipes in this book because Atlas takes the time to break it down by holidays and each is packed with flavor. I am always tasked with bringing a vegan dish to potlucks (my grandmother can’t have cheese so most casseroles are out) and this book gives me so many different ideas and all of them are do-able (no uber-gourmet dishes here). The color photographs are beautiful and the recipes are easy to read and follow – double win! Yakov Golyadkin doesn’t know what’s happening to him and by the end, you won’t either. 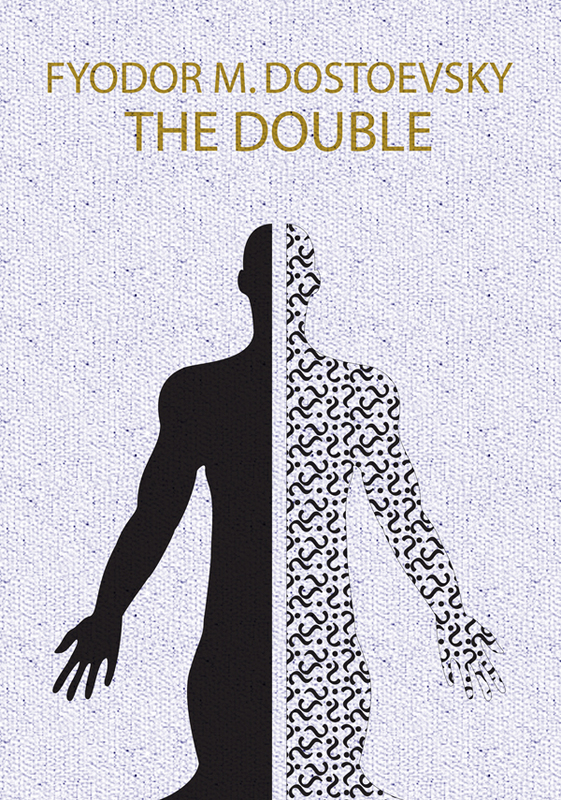 It’s a brilliant telling of psychological collapse as Golyadkin meets his “double” who steals his life away bit by bit until ultimately you’re left with only one. Dostoevsky weaves the story so intricately around the collapse that the reader can only hope to understand it by joining Golyadkin in his downfall. I have a soft spot for all of Dostoevsky’s work, but this one truly made my mind melt by the end – but in a good way! It’s a story that doesn’t give it to you straight and because of that, it’s hated by many. If you’re open to a bit of mind-play then I definitely recommend this book with a strong cup of coffee. Happy Holidays and may all of your reads be bright! Categories: Musings, Review | Tags: books, List, Review | Permalink. Sumo steaming the mochi rice. I would like to introduce you all to Sumo, my Tiger SMJ-A18U 10-Cup (Uncooked) Rice Cake Maker. My hubby generously bought me Sumo for my birthday. I had wishfully listed it on my Amazon wishlist, but I didn’t seriously think he’d buy it. For one, it’s a bit expensive (clocking in at around $200) and it’s a bit novelty (I mean, how many people do you know have mochi machines?). I love mochi. I love everything about it from its uniquely soft, chewy texture to its sweet filling. I love how you can eat it fresh without any fillings or plop a round into soup. I love how it signifies everything I love about being Japanese American – it’s a bit different, wonderfully unique, but oh so subtly sweet. I took Sumo down from its cozy spot on top of my fridge and loaded it up in my trunk this weekend to test it out with my family. 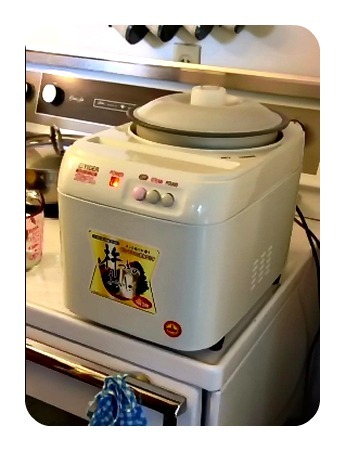 Everyone was also excited to welcome a mochi machine into the family since we all gleefully gobble it up whenever my mom makes a batch from mochiko flour. I tend not to buy the store kind since it always seems to lack that certain something compared to my mother’s. This time, though, we were going to make it straight from rice, do not stop at Go. According to the directions, you soak your premeasured rice in water for 6 – 12 hours. I carefully gave the instructions to my mother the night before. She had bought a special bag of mochi rice for me and she woke early the next morning, anxious to get the rice started. The mochi rice is slightly rounder and fatter than regular white rice. Each shiny grain looked swollen and almost translucent when I drained and shook the water out 8 hours later. The rice still had to sit for 30 minutes before we could place it into the maker along with the measured amount of fresh water and the impeller. The mochi rice being “pounded” the second time. We set it steaming and waited. Every now and then we would crowd around the machine and just watch as the plastic lid puffed steam. After about 20 minutes, we grew bored and moved away, every once in a while sneaking back to “check” on it like a sleeping newborn. Once it buzzed us into excited action (a very loud and continuous buzzer marks the end of the steaming), we hit the pound button and waited with baited breath. The machine instantly started to vibrate and shake the stove underneath. The rice wasn’t moving but we were certain that it was working – just really slowly. After the instructed ten minutes, we turned it off and furrowed our brows. 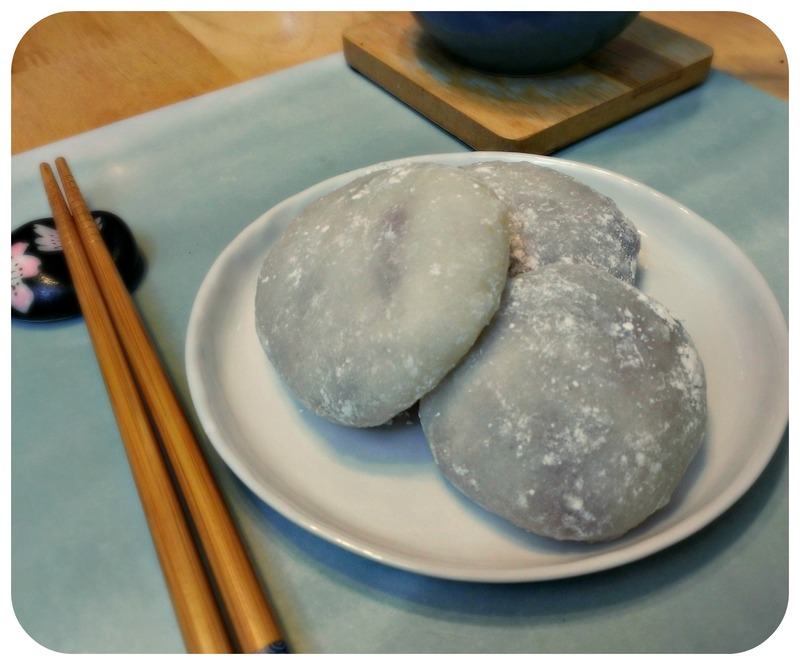 It looked different (each grain now a bit squished), but it didn’t look anything like mochi. I grabbed it and plopped it onto the corn starch prepared dish and immediately knew it wasn’t done. It looked like rice that had been boiled a bit too long and poked at a bit too much by a petulant 5 year old. With two university brains and one field experienced brain pondering the problem (my mother remembers pounding mochi with the traditional stick in her childhood), we decided to dump it back in, upside down this time, and add a bit more water. What a difference! Now the ball of rice was being whipped back and forth and spun within an inch of its previously granular life. The grains disappeared and the surface began to smooth, glisten and soften. After a bit more water and a bit more pounding, our mochi was done. Total processing time: 50 minutes. Sometimes it’s good to take risks. If I hadn’t been with my family, I might not have plopped the undone rice back in for further pounding. I might not have added quite so much water. I definitely wouldn’t have had as much fun. The mochi was delicious! Soft and flavorful with a heavy dose of home and family. My mother showing us how to make daifuku. 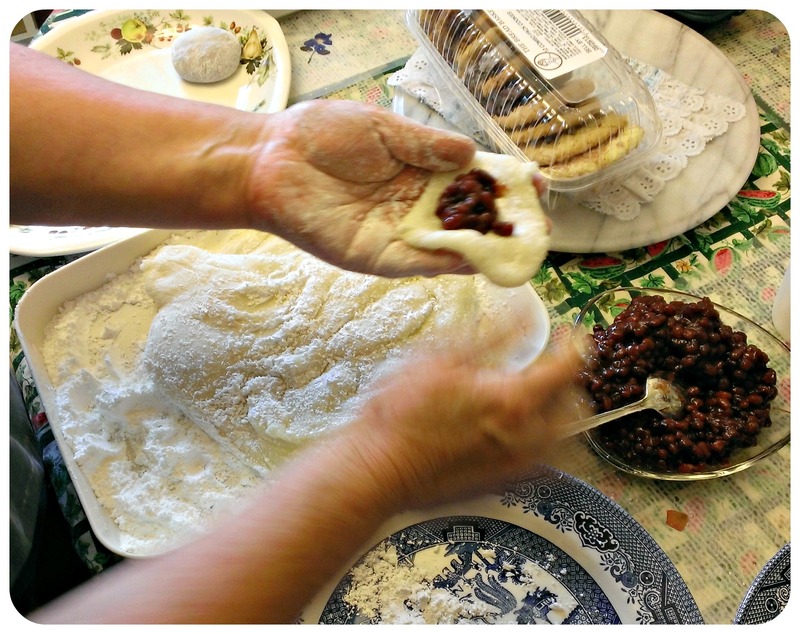 There’s something about eating food that connects you to who you are and where you come from. The smells, the textures and the experience meld together into a round disk that packs a punch of memories each and every time. 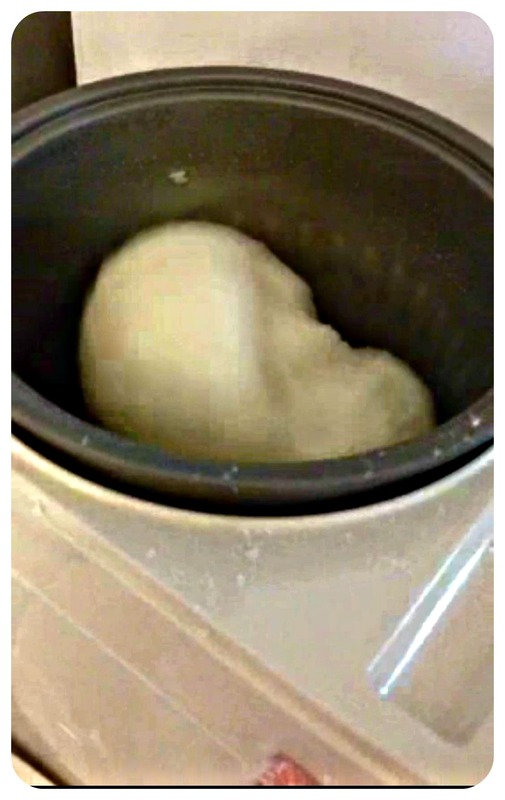 We soaked our rice for 8 hours and drained for 30 minutes and followed the steaming water directions, but the mochi was still too stiff for making daifuku. Don’t be afraid to add more water as the mochi is being pound. Try a tablespoon at a time until it reaches a consistency where you can grab a chunk and pinch it off easily. Don’t be afraid to flip your mochi if it isn’t being tossed within an inch of its life. Just be sure to hit stop, flip, and definitely reinsert the impeller before hitting the pound button (but be careful – it’s hot!). Soak and wash your impeller and mochi machine bowl immediately! I can’t stress this enough. The mochi gets really sticky and will stick to your bowl and impeller like glue, so don’t wait until you’re done making daifuku or rolling out squares. Definitely soak in hot water if you can’t wash everything right away. Categories: Review | Tags: dessert, family, japanese, Review | Permalink.